i am looking for necklaces, charms, or things i can make to wear around my neck to help with pyschic visions (specifically animal communication.) i have ordered a Pyschic Vision kit and will do it and burn a Pyschic Vision candle when it arrives, but i would like something to wear 24/7. Any ideas? The psychic vision kit comes with a mojo bag, which is carried. Beyond that, maybe an image of St. Francis? St. Martin de Porres is another one to learn about, as he is a patron saint of veterinarians. You might consider attaching all of the amulets/medals you mention onto a chain-link bracelet to make a charm bracelet--a common solution to the multiple amulet problem. Likewise, making a necklace of saints medals/charms/amulets is also an option--as with a charm bracelet, use a chain link necklace, and attach individual amulets to individual chain links, spaced as desired. Linking many amulets on one chain is a common solution, as ELKnapp said. For some people, however, this destroys the focus which they can place on each one. This may or may not be the case for you. I work with crystals a lot, and what ended up happening is that I have necklaces/bracelets all for a specific purpose. I try to make them different lengths so if I need to wear a few they work together without looking silly. Do some research on what cyrstals/symobls will work best for your purpose. Crystals for opening the third eye (I'm on little sleep so I'm not remembering right now) and maybe find a pendant of the animal/s you feel affinity for. Not quite rune related, but I was "apprehended" by Odin and so now I work with him. I made a necklace for him. He is associated with gold mainly, but also copper and brass. I use crystals associated with him - onyx, apatite, and carnelian, and added copper beads as well. It serves its purpose really well. To initiate it, I drew the rune representing Odin on a piece of paper (Ansuz) and other runes depicting what I wanted from the necklace. I did a small ritual, and burned the paper, and drank with Odin. It's what worked for me. The Norse bind-runes we sell, which are carved on bone, come in 23 different styles, for as many different situations and conditions. I would suggest for you perhaps the Helm of Empowerment style. She is associated with cats and mice, so perhaps other animals would fall in here as well. Additionally, she was a relatively noted psychic as well. I have found some icons of her that are available online, but don't bother contacting the Collegiate Church of St Gertrude in Nivelles, Belgium...I was there last summer and no one speaks English...if you are fluid in French, give them a try too. Are there any specific animals associated with physchic vision or communication?I am looking for medallion or necklace of Saint Francis you do not have one are you ever gonna get one?? Sharona22 wrote: Are there any specific animals associated with physchic vision or communication?I am looking for medallion or necklace of Saint Francis you do not have one are you ever gonna get one?? Hi, I have a few sites for Saint Medals but I'm not sure I should post them here on the forum since they are not LuckyMojo products so I sent you a privet message with the info. The St. Francis is for my help with animal communication,is there a ST. to help with clarity and focus?? He is not a Saint, but King Solomon is known for his wisdom and good judgement. Thanks Cat for Pet Items for saints I bought a few for many friends with pets whom I am close with because they were absolutely wonderful You made my day by getting one for my dog who has alot of health issues and when I start with my pyschic vision items and my stamina and crown of sucess I will order the triple mojo health for pets since it worked for others who reccomended it. So i had an idea that i wanted to send one of the parties for break up work. The female in the relationship works with autistic children. So I was thinking about sending her some autism awareness jewelry. Autism awareness usually has to do with puzzle pieces. I was going to dress it with appropriate oils break up...and powders. However, I was wondering would the symbolism of pieces would that be appropriate for break up work. Like theres a missing piece? Just a thought, and wanted some feed back. I'd look at it like a puzzle breaking apart - like she's a piece that in the wrong place, or doesn't fit, or whatever. That's very sneaky. Best of luck. Thanks thats what I was thinking. I found a piece of jewelry where its two puzzle pieces together and both makes a picture of a heart. So I can send the other part of the necklace away...makes a broken heart. But thanks for the feedback. I appreciate it. Hmm. An interesting idea. What strikes me is that a puzzle piece is meant to be put together with another specific piece. What I would do is get another puzzle piece that clearly can not fit with the one that is part of the jewelery and fix that and hide it in the home of the other person, or put it where they walk past it or over it. And on fixing jewelery in general I find that soaking them in a tincture or herb tea made with crossing herbs or break up herbs like hot pepper. Just a thought. Thanks HD. Well I guess i will get a piece of jewerly where it is a single piece and it doesnt fit together with anything. Sort of like a lost piece. I just saw a necklace like the one I described above, and thought that might work since it had the heart element that would be broken in half. But i think I will just get the single piece and send it. I like HD's idea of soaking it in Crossing and Break Up tea or tincture. I'm always cautious about anointing with oils since people usually sense that they've touched sometime foreign, plus BU oil has a pretty strong smell. I think this a great sneaky trick however. You cover all your bases, not only are you getting physical contact with the target, but you are also incorporating a symbolic link-the pieces. I like it. Thanks. I will make sure it doesnt smell peculiar. I have ordered the Eye of Agomotto (which is just cool on so many levels that LM sells this product) pendant which should be arriving any day now. I plan to comission this amulet to aid me in enhanced psychic ability and vision. I plan to adhere a few very small stones and crystals to the back of the amulet using automotive goop (a useful product I learned about in these forums) the stones correspond with psychic enhancement and third eye opening in some philosophies. I plan to annoint also anoint the amulet with psychic vision oil. Can anyone suggest anything else that may help me make the connection between my third eye and the Eye og Agamotto? Perhaps even a certain psalm or prayer to use? Also I would like to say thank you to the LM staff for being such a blessing and offering such fantastic products and information. Thank you. I was under the impression that the Eye of Agomotto was sold out and re-stocking time was undetermined! If these are back in then I cannot wait to order one. I have been very patient for a few years now. Thank you for the info, TheBeard! I am so sorry for misleading you. My package just arrived yesterday and the eye of agamotto was not included due to being out of stock. I called the shop and they did advise me that they do not know when they will get more in. I was pretty bummed out about it but hey LM sells so many great things I'll find a way to get over it. Again I apologize for getting your hopes up. I know the feeling as I was anxiously anticipating mine and when I reached into the bottom of my package and felt empty space after removing another item, I was crushed. I know the feeling, but I do understand how hard they are to keep in stock....and be at the mercy of the manufacturer. I will own one someday! This I know. hi, I came across this post and was interested, I do have a situation and was wondering what is the best way to work it, I have a guy I am interested in, we live together and been sexually active, but we are just roommates, however I want to develop more with him, I have access to everything he has, even helping with his laundry, he sometimes wears a gold chain, I want to know what is the best way to work it, not only for other females to stay away but for us to start a serious relationship. Good ol' Love Me is the answer, Colliz! I prefer incense for charging talismans and fixing jewelry -- but Turnsteel's tea idea is something I've gotta try! Take a nice bath in Love Me bath crystals, then set aside a jar of the bathwater to use in your guy's laundry. Just add it to the rinse cycle. You may want to handwrite a "Rinse Freshener" label on the jar, just in case. thank you for the reply, I like the idea of the tea as well, but I realize that he however washes the chain before wearing it because of dust, so does that mean if I was to use incense or the tea and he washes it, it would no longer work? Yes, it would weaken the spell after he washes it. Thanks Miss Aida for your reply. colliz, since this is your roommate, you can always dress the chain again as often as you need to. To keep other women away as well as to increase his interest in you, wash that chain with a dilute solution of your menstrual blood! hi, Miss Michaele, thanks for the reply, by washing it in a dilute solution of my menstrual blood would keep women away? or it there another spell for that? also every time he is about to wear it he washes it, because he usually just have it laying around when its not on his neck, so wouldn't that defeat the purpose even if he touches it b4 washing it? Well if he picks it up and he touches it, so the solutions will get on him. Sure they may not sit for ages on him but they still get on him. Dabbing a little oil (and I mean a little) on it means when he washes it unless he uses soap all the time, it will stay on the necklace. If hot footing someone can work when they walk over the mix wearing shoes, then touching the item with his hands will start the work. colliz, my suggestion about the solution of menstrual blood on the necklace was sparked by something I heard on the radio show many years ago. Miss cat recounted the story of a client who simply could not keep a girlfriend or a relationship until it was discovered that his ex had placed a used tampon in the pocket of a suit that he rarely wore. So, yes, in that case menstrual blood did its work even when the client was not wearing the object. So Shantilly Lace is right. Thank you so much guys, never thought i'll ever say this but I can't wait till my next flow. lol. Does anybody know of a seal or talisman that I can get to help with mediumship between me and my ancestors. Sometimes I can hear them sometimes I can't. Or if anybody knows of anything that I could do to strengthen the Bond more other than womb work. 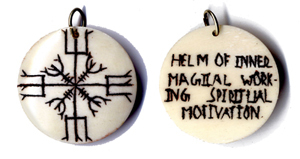 NORSE BONE RUNE SIGIL, HELM OF INNER MAGICAL WORKING, SPIRITUAL MOTIVATION, HAND CARVED PENDANT, 1 1/4"
I would also suggest just spending a bit more time around one's ancestor altar, meditating and talking with them. Good Luck! I've seen this sigil before. Thank you and lots of love. Lucky Mojo has a book on alter work that would be helpful with building and sustaining an alter while working with ancestors.